Absetzkabine - (Germany) - One of the German names for a demountable camper. Literally 'settling cabin' I believe. afzetunit - (Netherlands) - Dutch name for a demountable camper which, according to Google, translates as 'marketing unit'?! bed liner - (English-speaking countries) - Plastic liner fitted to protect the pickup bed from becoming scratched or damaged while in use. There are pros and cons of using bed liners with demountables. The camper can be moved more easily on a bed liner so minor adjustments can be made to its postion when loading it onto the pickup. That same ease of movement coupled with the flexibility of the liner makes it more difficult to remove all the free play in the combination. cabover - (North America) - Expression for the part of the demountable body that extends over the pickup cab, usually accommodating a double bed across the body. Some models of truck camper are offered with an extended cabover in which a double bed will fit lengthwise. See luton. camper - (Scandinavia) - A little dull perhaps but, as far as I have been able to discover, this is the only name by which demountable pickup campers are known in Scandinavia. cellula abitativa - (Italy) - Literally 'living cell' but more sensibly translates as 'accomodation unit'. Used by at least one manufacturer to distinguish their demountable camper from their other camper types. cellula per pickup - (Italy) - Pretty obviously, this is 'cell for a pickup'. Some Italian manufacturers simply use 'cellula' on its own. cellule amovible - (France) - Literal translation 'removable cell' but the French word 'cellule' doesn't have the negative connotations of the English 'cell'. It implies privacy and simplicity, as in a small monastery bedroom, rather than confinement, as in a prison cage. célula móviles - (Spain) - Another 'removable cell'. célula para pickup - (Spain) - Like the Italian version above, this is another 'cell for a pickup'. células amoviveis - (Portugal) - And yet another 'removable cell'. demountable camper - (U.K.) - The name most commonly used in the UK. Grammatically the verb 'to demount' didn't exist until the early 20th century when it started to appear in America along with its derived adjective 'demountable'. Why, or when, we in the UK took that adjective (as in 'a demountable camper') and turned it into a noun (as in 'a demountable') is anybody's guess. dismountable camper - (U.K.) - There's been a long debate about whether the name should be 'demountable' or 'dismountable' but the former is undoubtedly winning. The verb 'to dismount' can at least claim to have been around for a long time, since the 16th century at least, though many dictionaries dispute the existence, or correctness, of the adjective 'dismountable'. dry bath - (North America) - Manufacturers' description of a camper washroom facility where the shower is in a compartment which is separate from, or separable from the toilet and washbasin. Thus the shower can be used without anything else getting wet. It's usually only available as an option on larger campers. As opposed to wet bath. extended cabover - (North America) - See cabover. glide-on - (Australia) - Manufacturers' smoother variation of slide-on. hard-side - (North American) - Expression describing a camper with walls wholly constructed from inflexible materials. This would also normally imply a fixed roof although there is at least one manufacturer producing a hard-side camper with a telescopic roof. As opposed to soft-side. jacks - (English-speaking countries) - A demountable's jacks (usually four in number) are the telescopic legs that extend down to the ground and enable it to be raised and lowered into and out of the pickup bed. They can be manual or electric. 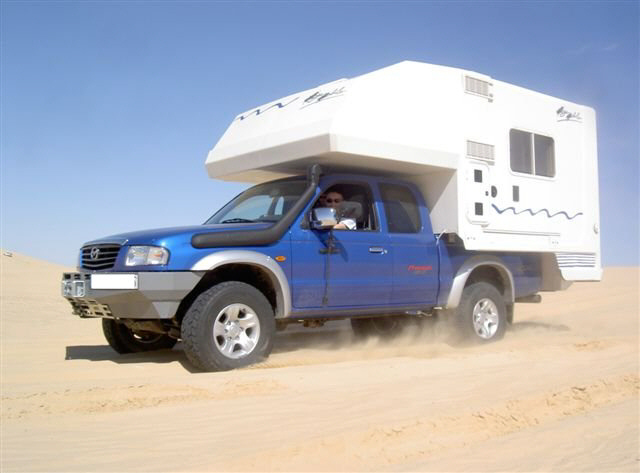 In North American models it is normal for the jacks to remain fixed to the camper, even when it is mounted on the truck. Jacks on European models are more commonly folded out of the way or removed completely for driving. luton - (U.K.) - The part of the demountable body that extends over the pickup cab, usually accomodating a double bed across the body. See cabover. pickup camper - (North America) - Not the most popular name in the US but my favourite because it most accurately describes what these things actually are. It's debatable whether, or not, it's a good thing but it's also true that both 'pickup' and 'camper' are words that have infiltrated many other European languages, giving 'pickup camper' international currency. Pickup Wohnkabine - (Germany) - The more common German description of a 'pickup residential cabin'. pop-up - (English-speaking countries) - Same as pop-top. ratchet strap - (English-speaking countries) - Webbing strap equipped with a buckle which includes a tensioning device and a ratchet mechanism to prevent the strap from slipping back and losing tension. Ratchet straps come in a variety of weights and strengths. They are used by some manufacturers, and by some owners, in preference to standard turnbuckles because of their greater elasticity. This, it is claimed, gives them some of the dampening benefits of sprung turnbuckles. slide-in camper - (North America) - The least common of the American names but favoured by some manufacturers. slide-on - (Australia) - As opposed to the American slide-in (see above), reflecting the Australian preference for flatbed trucks. slide-out - (English-speaking countries) - Camper body in which part of a side wall, and the furniture attached to it, slide outwards (hence the name), thus creating more space inside the camper. Normally only available as an option on the largest North American demountables. soft-side - (North America) - Description of a camper with walls made partially from soft and flexible materials thus enabling the roof of the camper to be raised and lowered. As opposed to hard-side. sprung turnbuckle - (English-speaking countries) - Turnbuckle with built-in shock absorption. When driving, sprung turnbuckles (common in North America but rare in Europe) dampen the impact of road bumps and vibrations and limit their transfer to the camper body. tie-down - (English-speaking countries) - Tie-down describes the part of the demountable system which is attached to the pickup, and normally remains there, and to which the camper body is secured by turnbuckles, ratchet straps, chains, or whatever. Tie-down systems can range from simple eyebolts fixed through the pickup bed to special chassis members bolted or even welded to the pickup chassis. tray top - (Australia) - Or 'tray topper', derives from the Australian description of a flatbed truck as a 'flat-tray' or 'tray-back'. truck camper - (North America) - The most popular name in the US and Canada, by far. Not surprisingly, as there are many more of these vehicles in North America than anywhere else, 'truck camper' will also produce the highest number of results if typed into Google or any other search engine. turnbuckle - (English-speaking countries) - Probably the most common form of fixture between a camper and pickup, a turnbuckle (usually made of galvanised or stainless steel) consists of two hooks or eyes which can be pulled towards one another, or pushed apart, by turning the central section into which they are threaded. By virtue of their opposed threads, if one of the hooks is put through a ring fixed to the camper and the other through a tie-down fixed to the pickup, the turnbuckle can apply tension between the two. Most campers are secured by four turnbuckles. ute camper - (Australia) - Or 'ute-style camper' is more usually used to describe a demountable unit for a regular, walled pickup bed. wet bath - (North America) - Used in descriptions by manufacturers, wet bath refers to a washroom where the shower, toilet and wash-basin are all in the same undivided space. This saves space, usually a necessity in a demountable camper, but means that when using the shower everything else in the room gets wet, hence the name. As opposed to dry bath. A glossary of terms specific to demountable campers. This page also lists some of the names most commonly used for demountables in Australasian, west European and north American countries. If you know of any, please let me know of other names in other languages. Obviously you can scroll down the whole page or jump to a particular letter by clicking on it at the top.